These eye catching iPhone cases are as individual as their owners! They make great gifts for yourself or anyone! Personalize with a name, monogram or initial. Products are available in hundreds of color combinations and are personalized with a name, monogram or initial. 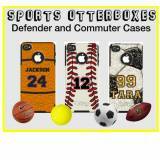 Please allow 3-4 weeks for your case to be customized and shipped.